October 08, 2018, 5:10 p.m.
With Swift&apos;s fans more likely to be Democrats, is the singer just preaching to the choir? Last night saw sparks fly in the Senate elections as Taylor Swift took to Instagram to endorse Democratic candidates in the key battleground state of Tennessee. Until now, the 28 year old singer-songwriter had maintained a reputation for keeping her politics a blank space, but as the US leg of her stadium tour came to a close she decided it was time to speak now. So how will this play with Swift’s fan base? 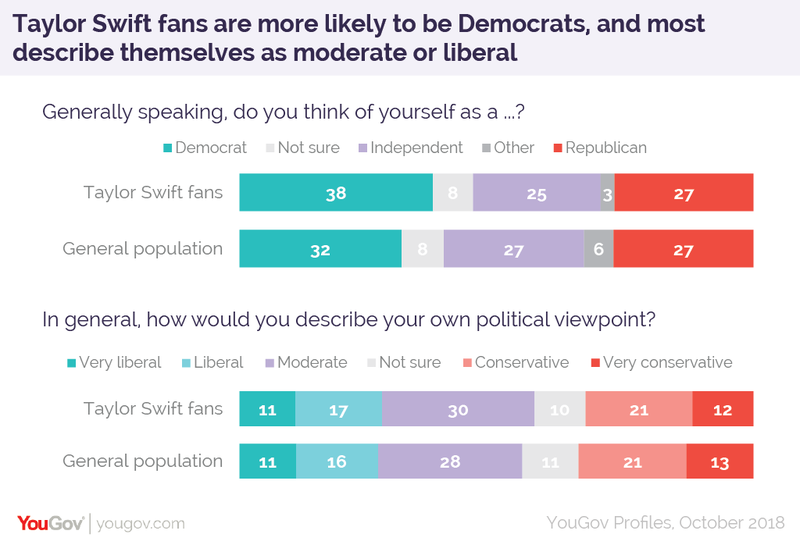 The move isn’t as treacherous as you might think, as speculation that Swift’s fans would more likely be conservatives doesn’t necessarily ring true, with 38% of them already voting Democrat compared to 27% who vote Republican. Indeed, a majority (57%) define themselves as either ‘moderate’, ‘liberal’ or ‘very liberal’. Politically her fans are strategically located as, according to YouGov Profiles data, they are disproportionately concentrated in the 2016 battlegrounds of Wisconsin and Pennsylvania as well as the 2018 Senate battleground of Tennessee. What’s more the favorite politicians among Swift’s fans are Barack Obama and Hillary Clinton, followed by more traditional Republicans like Mitt Romney and Marco Rubio. Just 3% of Taylor Swift fans have a favorable opinion of President Donald Trump. So while we can’t make any promises as to the impact of the endorsement (for example, academic research shows that celebrity interventions rarely boost a campaign’s volunteer numbers), studies do show that the political preference of celebrity followers may differ from that of the celebrity, meaning that Swift’s appeal may extend further than just her core fan-base. As to the ultimate outcome, November’s congressional elections will show if the previously outnumbered, raided and now cornered Democrats can change their fortunes and ride to victory on Swift’s coat-tails.